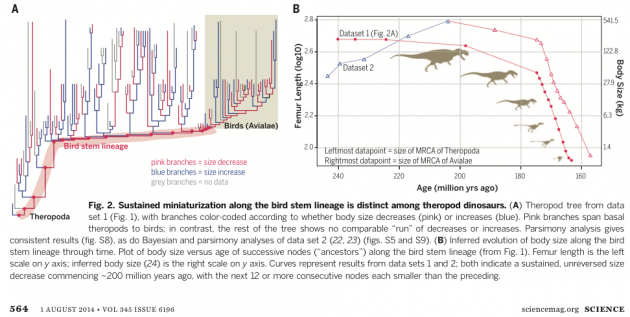 There is a fantastic paper just out in Science: “Sustained miniaturization and anatomoical innovation in the dinosaurian anceestors of birds” by Michael Lee, Andrea Cau, Darren Naishe and Gareth Dyke. I want to talk about this research but if you really want to know more about it, don’t rely on me; one of the co-authors of this important paper is Darren Naish, who happens to be a stupendous blogger, and he has written the research up here. So go read that for sure, and revel in the excellent graphics. Meanwhile I have a few random thoughts. Whales are cows. It is technically correct, and recently fashionable, to insist that any living animal is a member of the larger group that contains it phylogenetically, i.e., ancestrally, with that group often named after the known animal that roots the tree. So, for example, humans are apes. If we assume (probably incorrectly) that of apes and monkeys, they all descended from a monkey like ancestor, than apes are monkeys. In other words, the group of mammals that includes all the monkeys, which is rather large (and not accurately defined because I’ve not said what a “monkey” is … am I including lemurs?) and contains apes is referenced to indicate the complete clade. Fortunately for we humans, placing primates properly phylogenetically in relation to the other mammals requires an act or two of faith at the deeper ends of the family tree, but it is probably true that primates and rodents share a common stock to the exclusion of others, so maybe we are all mice. The point is, of course, that whales are not cows. Whales emerge from within the larger group of mammals that includes cattle, deer, pigs, camels, with camels being the most deeply rooted. (So pigs are camels, as you probably already suspected.) But if you were a biologist in training and you told your advisor you had a grant to study cows, and then took off on a boat to study whales, you would cause more confusion than necessary. You should have said whales. Even though whales are cows. In other words, it requires a detailed and rational understanding of nature to know that a tomato is a fruit. It requires wisdom to not put the tomato in the fruit salad. But birds are dinosaurs. When people say that they are not being funny, or overly cladistic. Birds have a number of features that distinguish them from, say, camels. They are small, they walk on two limbs (the hind limbs), they have pneumaticised bones and a special relationship between their lungs and those bones that allow for efficient air flow, they have relatively large brains, beaky things on the front of their heads, a massive sternum and a wishbone, various features of the pelvis and leg bones that relate to the way they stand and locomote, small tails that don’t swish or squiggle around like a camel or a lizard, and so on. Oh, and they have feathers and most of them fly, and most of those that do not fly descend from fairly recent ancestors that did. Whales have a blow hole and fins, and they swim all the time. Cows do not. Nor do camels. In fact, very few of the members of that large clade that includes the pigs are very aquatic at all, though there are a few and they are not very whale like. But, if we scaled back (which we would have to do because birds are way deeper and more diverse than whales, evolutionarily) and look at bird traits, we see that many, probably most, and in some form or another perhaps all, of these bird features other than full fledged flight, and maybe that too in an undiscovered fossil species, are found among a vast array of dinosaurs. In other words, if whales were to mammals what birds were dinosaurs, then camels would have blow-holes and okapis would have fins. Long term unidirectional evolution is not terribly uncommon. For example, among that same clade of mammals that includes pigs and whales, there has been a general tendency towards larger body size over time, until recently. The ancestors of the moose were tiny forest dwelling creatures, for example. There’s even a “rule of science” for this, called “Cope’s Rule.” This states that evolutionary lineages tend to produce larger and larger forms over time. One could say that Lee et.al. is remarkable because they’ve discovered a major exception to Cope’s Rule, except we kinda stopped taking Cope’s Rule very seriously a long time ago because it is so often not true. But, still, many tens of millions of years across 12 major nodes with no exceptions of ensmallening of the lineage leading to birds is pretty major, an extensive and intensive trend that I can’t think of any other examples of. Also, just so you understand the coolness of this — one of the key features of birds is their small size, and here we see, within dinosaurs before birds, the decreasing in size happening before birds are a thing, and perhaps not as obviously but very amazingly, among huge dinosaurs. It isn’t like something a bit too big to be a bird happened to become smaller and then birds were possible. The first several steps of this one way evolutionary trajectory were big, huge, scary dinosaurs giving rise to more big, huge, scary dinosaurs that were just a bit smaller. And smaller. And smaller. Until turkey size or so. Also, subsequent to this series of evolutionary changes, a lot of animals branching off from those ensmallening lineages got bigger. In the image at the top of this post, the red lineages are smaller and the blue lineages represent an increase in size. Notice in particular how many bird lineages show increases in size once bird get going. One of the most important features of bird evolution, according to Darren, is that smallness may actually account for, or at least, go hand in hand with, a number of other bird traits. So bird size explains birds, or bird-ness drove decreasing size. But the decrease in size happened from the very beginning of the larger category of dinosaurs that includes the birds. So even this feature, smallness, was being selected for among a wide range of dinosaurs and for a very long time. The paper is not available on line unless you subscribe, but as suggested, you can read the blog post at Tetrapod Zoology, here. Hmmmm, but what if the Mokele-Mbembe was indeed an Okapi with fins? Whales are in no sense cows. Whales and cows are both artiodactyls, but completely disjoint clades therein. Cladistically, we are apes (hominoids), and apes are monkeys (simians or anthropoids). But lemurs are a distinct clade of primates. Primates are not mice, but primates (along with other euarchontans, like treeshrews and colugos) and mice (along with other rodents and lagomorphs) are members of Euarchontoglires. Thanks Mike, that’s food for thought. Cows are antelopes, to follow Mike’s point, as are sheep. Duncan: that’s only correct if you think that Bovidae is synonymous with ‘antelope’. I don’t think it is (rather, the term antelope applies to two or three lineages within Bovidae).